Looking for the latest new helmets on the market? We work with the largest distributor in the world for our new helmets. We utilize our partnership to bring you the best products, the lowest prices and the top brands that you are looking for. As the season change, be on the lookout for our seasonal products. In the winter time, we will constantly adjust & add the best ski, snow, snowboarding, snowmobile helmets on the market to our database. In the spring, we are on the look out for the top team sports & new motorcycle helmets that bring you the best protection possible. Our helmet selection is unique. Most helmet companies are great at marketing their product by using fancy graphics, brand names & licensed logos. but here at HelmetFellas, we look past that. We look at the safety aspect of the helmets because…well, that’s why you are purchasing the new helmets right? We really look into the products as if we were going to wear them & in the unfortunate case we need to use the helmet, we want to have the safest helmet on our head as possible. Each category of helmets have a unique set of safety standards. You wouldn’t use a welding helmet to ride a skateboard, correct? The elements of safety change to the elements you might encounter. So we focus on our new helmets to determine if they are the best of the best in each category for the price point they represent. If you happen to know of helmets that are not listed on our website that you would like to see, please send us a Facebook message so we can add them to our website. Just mention “new helmets” & we will do our best to get you the best price on the helmet you are looking for. Package included:1pcs Full Face Mask +1pcs Military Patch The material is environment-friendly, poison free and no smell. It can effectively prevent from attacking by bb bomb. BETTER AIMING: Soft and Slim Iron face allows low profile aiming positions. The mesh is breathable lightweight, and durable.It's sturdy and seems well-made.The fabric that edges the mesh is soft and feels sturdy. The back strap is flexible elastic plastic buckles that work well. FULL METAL mesh face mask that provides superior protection. This is an excellent item that will prevent busted lips & major dental. This lower face guard is easily bent to fit the contour of your face & sits really nicely on the head due to the double-straps.You can also bend and mold the mask a little to fit your use, it is metal, so you can form it how you like. COMFORT: The material is covered in a soft coating so it doesn't irritate your face. Note that it has a multi-back strap, keeping it on with elastic bands and pressure that's adjustable. The elastic head piece sits on the back top of his head and allows your helmet and goggles to go over the top. 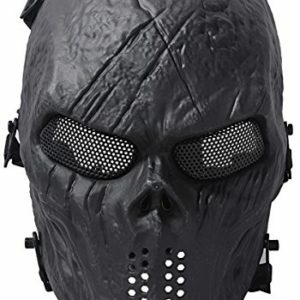 Full head protection: The air soft skull face mask shooting offers full face protection for airsoft and other outdoor sports- CS and field paintball, costume for cosplay and party movies. This airsoft mask is lightweight and enough strong to protect your face and eyes when you play airsoft. A sturdy metal mesh eye shield even protects your eyes. Does not affect the sense of sight, you can also wear glasses or headphones and ensure aimed shot. Package included:1pcs Full Face Mask +1pcs Military Patch Death skull bone style full face cover is a comfortable,which made by high intensity material. protective, and threatening mask It can effectively prevent from attacking by bb bomb. The paintball goggles strongly prevent from UV according to USA's International standard UV400. High transparency. Scope clean and mounted. TPU paintball goggles frame: The goggles can strongly prevent from Shooting hit 150 m/SEC within 10M.Making sure you are safety when you playing paintball. The goggles frame lateral has ventilation systems and high-density black breathable foam inside help draw warm air out of the paintball mask interior.